Your Eminences, Your Graces, Reverend Fathers, brothers, sisters and children! and the Lord Jesus Christ" (Romans 1:7). The Holy Apostles customarily greeted the first Christians with these words when addressing them in person or in writing. And with these words I also, an unworthy bearer of the grace of the Apostles, permit myself to greet you today. These are great words—great in their significance and meaning. By them the Apostles showed wherein man's true good lies, and gave voice to the desire that Christians receive it. Man strives for happiness, strives to find it; yet for the most part he seeks it far from where he should. Thus, by these words the apostles clearly directed the Christians to that path which leads unfailingly to the desired good. Only in peace of soul is there true blessedness for us; only those who possess an untroubled conscience before God and their fellow man can really be called happy. It is never too late to obtain this happiness, this peace: one need only actively strive towards God to the limit of one's abilities, trying to live in love and peace with others and to resolve firmly to begin a new, pious life. Then the desired peace will flow into our soul in a calm, almost imperceptible stream, and with God's help we will quickly sense that we have become happy. Then will no trials seem difficult and unbearable for us—neither sicknesses, nor poverty, nor sufferings, nor any type of problem or disorder, nor slander, nor persecution, nor imprisonment. All such things will be shown to be insignificant and easy to bear when compared to the great good which will fill our souls and which we call peace and a pure conscience. His Eminence, the ever-memorable Metropolitan Laurus lived in peace with God and his neighbor. He believed in God and trusted wholly in Him and His guidance. He humbled himself and bowed to the will of God; that is, he gave himself over to it completely and joyfully. From him there always wafted forth an unbelievable peace and inner tranquility. His peaceful spirit preserved us in unity and led us to reestablish the fullness of brotherly fellowship within the Russian Orthodox Church. For this reason, with reverence, love and a sense of personal unworthiness, I pay homage to the struggle of his ministry and his blessed memory, just as I revere the struggle of the primatial ministry of his divinely-wise predecessors, who "rightly divided" the word of Christ's Truth during the difficult years of the Russian emigration. I trust that the Lord will grant my unworthiness to carry out if only a portion of what my ever-memorable predecessors accomplished in their service. This is what my constant prayer is; it is for this that I ask all of you to pray. Our leaders, the organizers of Russia Abroad, always taught that we must preserve what we have, so as to serve Russia and the Russian Orthodox people in the homeland and in diaspora, and to include in the process of salvation its spiritual rebirth, which is, as we see, the direct fruit of the sufferings, the confessional ministry and martyric struggle of the millions of new martyrs and confessors of Russia. And laboring as missionaries, we must also share this rich inheritance with the world that surrounds us. The Russian Orthodox Church has always felt a particular calling to the missionary ministry. We must take particular care for this, continuing the holy work of those who served here and enjoyed success in their apostolic labors: St Tikhon the Confessor, Patriarch of All Russia; and St Innocent, the Equal of the Apostles, who later became Metropolitan of Moscow and Kolomna. May they help us, by their fervent intercession, to share pure and unadulterated Orthodoxy and the glory of the Russian Orthodox Church with all who surround us! On this day, which for me is "appointed and holy", with all my heart I greet my brother archpastors, the pastors and all here assembled in the home of the Hodigitria of the Russian Diaspora. I am moved to the depths of my soul by the love of our flock, by their words of greeting, comfort and support, their good wishes and prayers. In particular, I greet the representatives of the clergy and flock of the Diocese of Sydney, Australia and New Zealand, which was entrusted to me by the Council of Bishops in 1996. During my service in Australia, my pious flock, which the ever-memorable Metropolitan Vitaly called "the pearl of the Russian Church Abroad," became like my own family. May God grant that, with the help of my staff, I may try to combine my duties as First Hierarch with my previous diocesan duties in the land which lies beneath the Southern Cross. I express my profound gratitude to His Holiness Patriarch Alexy of Moscow and All Russia, for his primate's blessing and prayerful support; as well as to Archbishop Innocent of Korsun and the members of the Moscow Patriarchate's delegation. I thank my brother archpastors, who have elected me, for their trust and holy prayers. Today, we listened to the Gospel account of the Lord's healing of the paralyzed man. Paying close attention today to this scriptural passage, I felt that I am paralyzed by many weaknesses and am in need of God's help. For this reason, I place my trust in God Who helps us; and I trust the ministers of His Church to His carry out and do His work in a worthy fashion. I trust in the archpastoral wisdom, counsel and support of my brother concelebrants, and in the prayers of the clergy and the whole flock of our Holy Church. "Behold now, what is so good or so joyous as for brethren to dwell together in unity?" (Psalms 132:1). Or, to put it differently, how good and pleasant it is for brethren to dwell together, that is, in peace and love, says the Psalmist. In the early days of Christianity, pastors and flock always lived the same life: the sorrows and joys of the pastor were at the same time the sorrows and joys of the flock, and the sorrows and joys of the flock were also the sorrows and joys of the pastor. If, fathers, brethren and sisters beloved in the Lord, it is in general difficult for us to imitate fully the holy and pious life of the early Christians, let us try to borrow from them if only this trait, which is so precious to the Church. May the peace of Christ reign in our mutual relations: between me, your unworthy First Hierarch, and you, my dear fellow archpastors, brethren and sisters in Christ. Let mutual trust and love prevail between us. I will support you in your every need, and you will do the same for me. And thus let us fulfill the commandment of God Who loves us all, and Who said: "Love one another" (John 13:34). Amen. 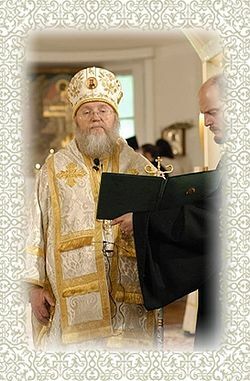 I would like to Congratulate His Eminence Hilarion who I have known so many years . Always working so very hard and very devoted to the Orthodox Church and his flock . I have never come across such a kind , helpful , patient , compassionate and humble Spiritual Father in my whole life as Apostle Paul in Corinthians 1 Chapter 13 teaches us all . Always guiding me through difficult times and pulling me through and for this I thank him wholeheartedly for all the encouragement he has given me to stand fast with my walk in the Orthodox Faith . It also was a very sad time for all here in Sydney Australia and we all miss him . We all hope and pray that he remains ruling Bishop here and always with joy and gladness we await his visits . Many years Father and may our LORD JESUS CHRIST always keep you safe and well Amen .